If you are new to piano and don't know where to begin, you have come to the right place. This information will get the results you want and AMAZE you in the process. With Rocket Piano you'll discover how to read music, how to improvize, how to play Jazz and Gospel, and how to play with the magic and "feel" of a professional. We designed Rocket Piano to be the easiest system to learn to play the piano available anywhere. Rocket Piano is jam-packed with quality information, including hundreds of sound files, pictures, diagrams, videos lessons AND step-by-step instructions training you to read music AND play by ear. There are probably hundreds of songs that you want to learn to play on piano, and you're probably using outdated methods to learn to play them without even knowing it! That's why we've created this web page, so you can discover an amazing, new piano learning method that will teach you how to play virtually any piano song you hear, with the timing, rhythm and magic of a professional. We wrote Rocket Piano because we were fed up with the quality of learn piano products on the market. Studies show that 97% of all pianists discover that learning how to play piano isn't as easy as they thought it would be. If you use the same old boring exercises and drills that other people use, you're even worse off! In Rocket Piano you get three books of step-by-step lessons, video demonstrations and high quality sound files. These lessons take you on a journey from beginner to an advanced skill level by fast-tracking your development, while covering every aspect involved in learning to play piano. The lessons are all laid out in an easy to follow, step-by-step method. They are very easy to understand no matter what age you are and we've gone to great lengths to ensure that they are fun! 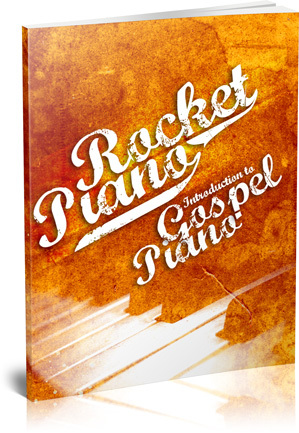 With Rocket Piano you also learn several classic songs as well as original songs that are exclusive to Rocket Piano. You will learn all the skills you need to be able to play any song you want! This is something you don't get with other piano courses. They just teach you songs in a book and that's about it. 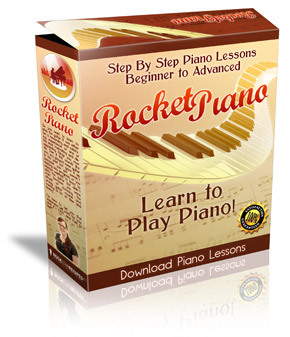 Rocket Piano gives you the skills to be able to learn to play the songs YOU want. That is a valuable skill that will be with you for life! The course doesn't just teach you the practical playing, it also gives you a sound grounding in music theory and gives you a background in piano, its history and how it works. This is really great information that a lot of piano players never bother to learn and subsequently they never achieve an advanced level of ability. It's this essential knowledge that will take your playing to a new level. And don't worry about music theory being BORING! We KNOW most people get frustrated with theory courses. They're way too technical! We see this with a lot of students who come to us and know it is simply not good enough! Rocket Piano specifically tackles these issues and gives you theory in a way that's fun and easy to remember. With our method of learning the intricacies of music theory and how it works, you'll be hooked! It's actually quite addictive! You'll also learn important things like how to play the piano to communicate a feeling or emotion. Composers create a piece of music to express something, and by learning music language you will be able to understand the feeling the composer intended and be able to communicate it exactly! When people hear you play they'll say "that song you played really touched my heart" or "I can understand what that song is about". It's more than the notes themselves that communicate that feeling. It's the way you play and express the music. This course teaches you how to get the most out of your playing. Rocket Piano teaches pianists at different levels and abilities and that makes it special. It caters for the absolute beginner by teaching the theory of a technique, and then applying the technique directly to an original piece of music. This way you get hands on experience with each technique as you learn. And don't worry about not knowing how a piece of music should sound or how you should be playing it. Each piece has an audio example to show you what it sounds like. Rocket Piano also teaches you how to improvise. You learn about melody, harmony, chords, arpeggios, scales, and how to play chord progressions in any key. You'll be able to play a solo to really impress your friends and fellow musicians. You will learn how to read music from nothing but chord symbols! You will be able to look at a page of chords and be able to play the song convincingly. Many musicians are intimidated when they have to play something they haven't practiced! The trick is learning the theory and techniques to improvise, so that when the time comes, you'll find it easy. Rocket Piano shows you how! You will be the centre of attention and other musicians will be wanting YOU to play with them! "I thought I would let you know that I purchased the full package. Nevertheless, I am going through the free lessons as well. More importantly, I am legally blind and so far have been able to follow the lessons reasonably well. The only problem I have had of any consequence is one of the games, something to do with keyboarding, I think. It is designed in soft pastel colors and therefore, unusable by me. The rest of the games offer good contrast and have proven quite beneficial. All-in-all I am quite pleased thus far. My low vision is creating obstacles, especially in reading notes on the staff. Hopefully my vision will allow me to finish the lessons. I waited rather late in life to learn a musical instrument, but this is important to me. Thanks for a very good product." 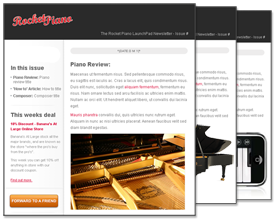 The LaunchPad Newsletter and Complimentary Beginner Piano Course we've assembled will give you the advantage you need to be an impressive pianist. Weekly Newsletters packed with the latest piano reviews, 'how to' articles, composer reviews and inspirational videos. Complimentary access is limited, so enter your email address in the form above for FREE, INSTANT ACCESS. You will learn the basics of melody, harmony and rhythm the three fundamental parts of music. Don't forget the many original songs that you will find in no other course, especially for you to learn to play, and also classic tunes that you will recognize. You'll learn about key signatures and time signatures so you can read a piece of music. You'll learn dynamics and performance. This is the "icing on top" of the music you play. You will also learn more complex rhythms and get to know more complex chords so that you can convincingly play music in a jazz or gospel style. Learn to perform the trickiest of piano skills. That's over fifteen years worth of expensive and hard won information in a simple and easy to follow format. It's comprehensive knowledge at your finger tips! This book is part of the Rocket Piano package. In it you'll gain a comprehensive grounding in Jazz, including its history, distinctive rhythms, underlying qualities, rhythmic movements, common Jazz chords (and how to play them in different Jazz arrangements), how to break Jazz songs down and play them, and much much more! 26 Rocket Piano Jam Tracks - With Piano Performances and without. We know you will enjoy playing along with a band. There are a wide range of backing track styles through each book. Best of all it's really fun to practice with a solid rhythm section. NEW Rocket Piano Quizzes - Quizzes are placed throughout the book to see how far you've come in your learning. Check your answers to see how high a score you can get! This is just the tip of the iceberg! There's so much we couldn't possibly list it all here. We're offering you a complete piano learning system. It is jam-packed with information, including three books, 133 sound files, 57 video lessons and three fun learning games! And, you can access it all right now, instantly, completely risk-free. It's Rocket Piano - The Ultimate Piano Learning Kit. With this information you'll learn to play the piano while saving hundreds of dollars in piano lessons. Even group piano lessons can cost $30 an hour and more, and PRIVATE lessons cost as much as $100 an hour. Imagine if you did not need a piano teacher, how much would you save? If you went to a piano class for just one hour per week for three months, you'd already be spending over $360! 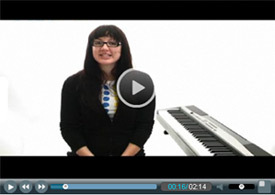 With Rocket Piano you'll save thousands of dollars in tuition fees! But just as important, you'll have the satisfaction of knowing that you can now play the many popular piano songs you've always wanted to play. And best of all, you'll be able to start playing many well known songs in less than a week! (Note: Due to the wide-ranging complexities of various songs, some songs take longer to learn than others, however we break even the most complex songs down into their simplest "chunks", teaching you step-by-step how to master each "chunk", and include a comprehensive collection of sound files for you to play along with). 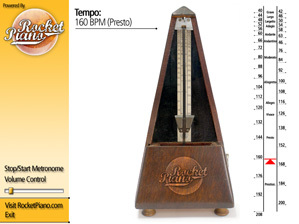 "Rocket Piano has fantastic bonus software, I use the metronome alot when practicing my sight reading drills." Calling this piece of software a game is actually pretty deceptive - you don't have to use it long to see why. In the space of a few hours you can have vivid photographic memory of the entire music stave and feel like you've hardly had to work at all. 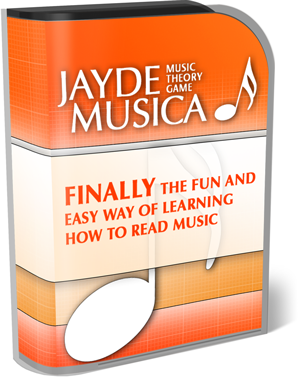 Beginner to advanced levels, complete with high scores - Jayde Musica really is something else! 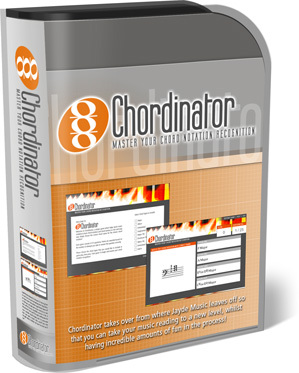 Chordinator is the perfect addition to Jayde Musica, with this software you'll soon be able to read piano music like you read the newspaper. You'll be very impressed with yourself after just a few short games with Chordinator! "The interesting thing about mental visualization is that it uses most of the same pathways in your brain as when you perform the activity physically. The only thing missing is the follow through, where you lob the ball at the hoop or hear the noise ring out of the piano." The best thing about mental visualization is that you can do it without your piano. On the bus, in the car, or before you go to sleep at night, mental visualization is also a fantastic excuse to do at every opportunity! You will not find anything like this book anywhere else. 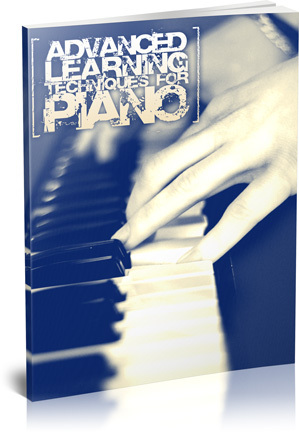 It contains some of the most valuable information that you will ever learn about learning the piano. On its own this book is normally worth $19.95 - you will receive it free! You've probably heard from musicians and piano teachers, just how important it is to train your ear in order to both transcribe songs and play piano better. It's hard to believe, but within 2 weeks you could be transcribing songs from the radio with precision and accuracy, just by playing "Perfect Your Pitch Pro". 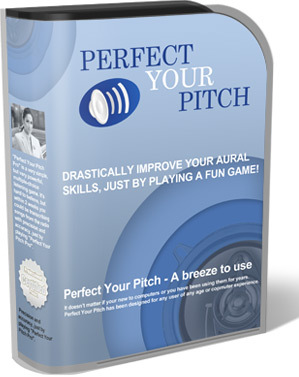 "Perfect Your Pitch Pro" is a very simple, but very powerful, multiple-choice listening game. It ranges from easy to hard. Your friends will be saying that "you have a great ear for music". And you'll not only find it far easier to transcribe songs from the radio, you'll have a better ear for music and that will in turn pay you big big dividends on your piano playing progress. What an opportunity! "My song writing and overall piano playing have benefitted greatly from your Rocket Piano course. I have especially gained a lot from 'perfect your pitch pro'. Now I can figure out songs and improvise much much better!" We insist that you order Rocket Piano entirely at OUR risk. This learning kit comes with a 60 Day 100%, Money-Back Guarantee. There's absolutely NO RISK on your part. 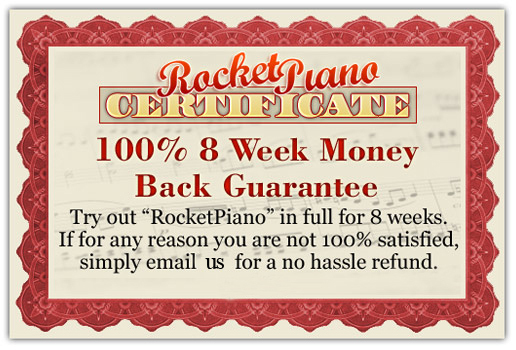 Here is our NO HARD FEELINGS, no hassle, 100% money-back guarantee: Try my Rocket Piano course for up to 60 days. If it doesn't live up to your expectations and everything we say and help you to dramatically improve your piano playing, then just email us and we'll promptly issue you a full refund. Now let us take this guarantee one step further. Don't feel like you must "use" these techniques in order to get a refund. If you don't like Rocket Piano for ANY reason, you can return it for an immediate 100% refund of your purchase price. And remember, you're free to return it next week, next month, or up to 60 days from now. Finally, because you're entrusting us with your time and confidence, we want you to keep the Six Free Bonuses free of charge, even if you return Rocket Piano. That's a guaranteed gain no matter what you decide! Now picture this: It's a year from today (or a lot sooner), and you've become the impressive pianist you'd always dreamed of being - with a lot less effort than you expected. Even better, you know for a fact that you have the skills, resources, and you know exactly what to do with them to become an even better musician. Now, stop and look back on today. 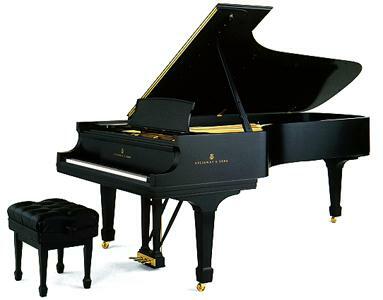 Considering that you've now become a fantastic piano player, what price tag would've made it a good investment? You will have access to the Rocket Piano Members Area immediately, so you can start learning amazing piano skills within five minutes! Even if you have never downloaded something from the internet before, it comes with instructions so it's easy! Goods and services provided by RocketPiano.com. We look forward to getting a letter from you, telling us about your piano learning experience and about all the people YOU have impressed with your new found piano playing skills. Even though we get an enormous amount of mail, please write to us. we'd love to hear your success story! P.S. Remember, We guarantee that you will find that Rocket Piano is the best system available for learning how to play piano; otherwise, you can return it next week, next month, or even up to 60 days from now for a prompt 100% refund... PLUS... you still get to keep the two FREE Bonuses. P.P.S. If you don't order Learn to Play the Piano with Rocket Piano right now, how will you discover the magic and fun of playing all your favorite songs on Piano? You have nothing to lose ordering Rocket Piano - The Ultimate Piano Learning Kit, no matter what country you're in. START YOUR JOURNEY TODAY!